Most of today was spent waiting for CRT to reopen Winkwell Bottom Lock. I’d previously walked down to B&Q in Hemel Hempstead where I purchased a new nozzle for the hose and some sanding disks for a task later in the year. Both of us remember going to the same B&Q store by car when we were killing time whilst the lawyers attempted to recover Waiouru from the first builder. We hadn’t intended to visit Hemel Hempstead, it just seemed to happen. 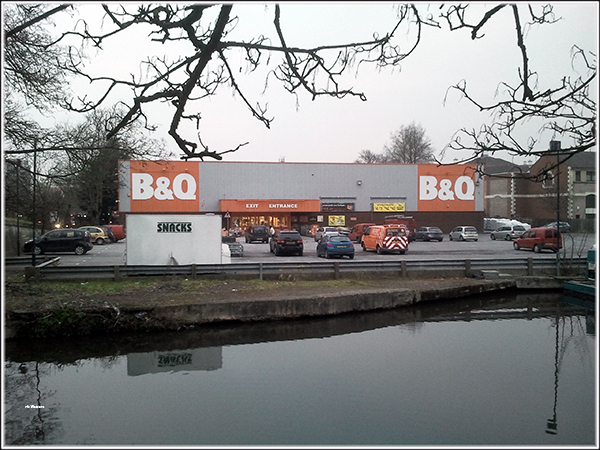 Actually we were trying to stay away from canals only to find the B&Q is beside the Grand Union. Whilst walking back to Waiouru I met Mick (nb Lillyanne) and then realised I must have walked passed Lillyanne on my way to B&Q. I must have been deep in thought at the time! Around 2pm there was a knock on the boat. It was Mick & Pip from Lillyanne. They had walked up to see how the work on the lock was progressing. We want to go south and they are heading in the opposite direction. There was time for tea/coffee and a chat before heading back to the lock to check the opening time. We may catch up again later in the summer. Strangely toilets were not discussed. 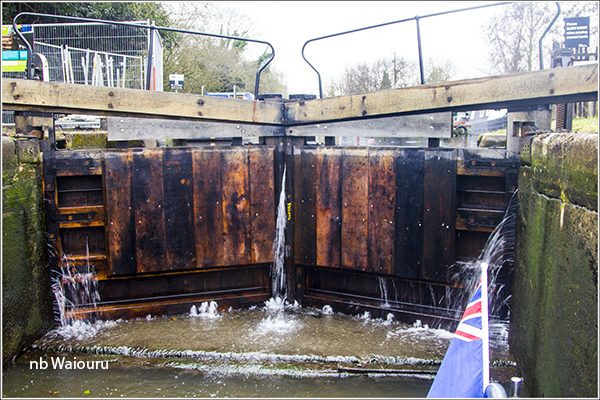 There was a 30 minute delay and then CRT filled the lock in preparation for taking one of their working boats down. Jan had already worked Waiouru through the swing bridge and I was hovering in the middle of the canal waiting instructions. Paul Balmer. Jan reports the towpath barrier arm does brush one of the thinner branches. 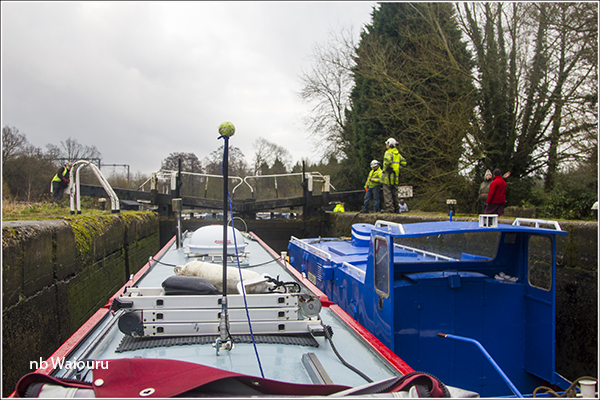 The CRT workers invited us to share the lock with them. I thought that was rather generous of them and then realised we would be sharing the testing of the lock being the first boats to use it. 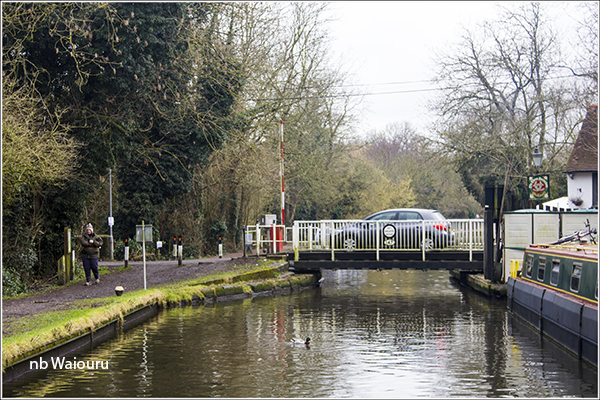 It was close to 4pm by the time we entered the lock. Hopefully the leaks in the new gates will subside as the timber swells. Mick was steering Lillyanne below the lock but as I was manoeuvring around a number of boats (before running aground) there was only time for a quick wave. 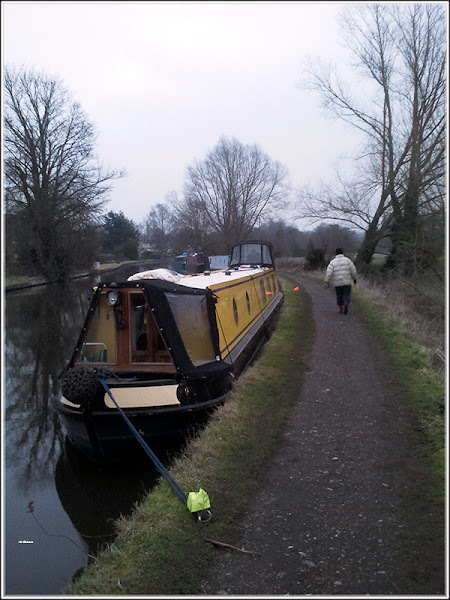 We managed four locks before it started to get dark around 5.30pm. Eventually finding a vacant space above Apsley Top Lock. That workboat looks very shiny!